Giving a small bathroom an inviting atmosphere is no easy task. It’s not like a large bathroom in which you can just place cabinets and decorative materials all over the place. With small bathroom design, you have a limited amount of space in which you can work. However, it’s not impossible to design a small bathroom. Here are 6 small bathroom ideas. Square designs have had their time, but that time is coming to an end. More and more, people are starting to cut off all edges and go circular. Round sinks, mirrors, and other bathroom necessities take up less space, leaving room for you to place other important appliances and items. 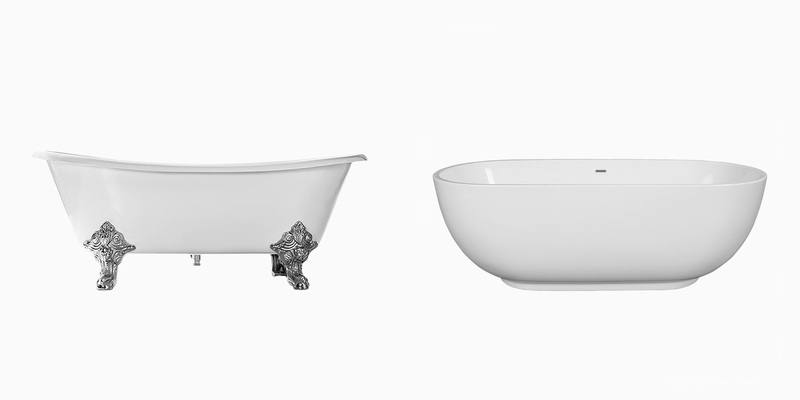 A great way to free up space and give your bathroom an attractive, modern look is by getting a Clawfoot tub. 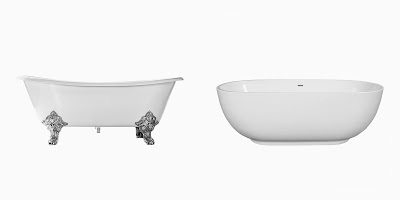 Freestanding bathtubs, specifically those adorned with clawfoot stabilizers, have become increasingly more popular. Not only do they look gorgeous, they also provide you with plenty more space to place and store necessary bathroom items. While cabinets and vanities are not an absolute necessity in a bathroom, they can be useful. In order to save space in your small bathroom, you should look for furniture that is tall and skinny. By storing your items vertically, you will save floor space, leaving more room for other necessary bathroom items. Another one of many small bathroom ideas is to elevate your bathroom vanities and cabinets. Mounting a vanity to the wall under your sink will give you space under the vanity in which you can place items such as trash cans, baskets, and otherwise. Not to mention, an elevated vanity will give your bathroom a certain appeal that it can’t get from a standing vanity. Sometimes the only thing you need to enhance your small bathroom is to make it feel big. This can be accomplished with the use of ambient lighting. Though direct light is still important for everyday bathroom tasks, an ambient light below your cabinets, behind your mirrors, or above your shelves can serve to provide your bathroom with atmosphere and style. Another way to make your small bathroom feel big is by installing smaller fixtures. Using a miniature, wall-mounted sink, or a compact vanity can help to make your small bathroom appear huge. Anything that you can do to free up floor space will be helpful in making your bathroom appear bigger.